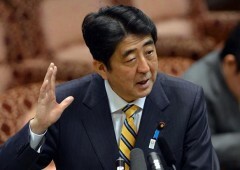 Japan Prime Minister Shinzo Abe has ordered a “decisive response” on any Chinese attempt to land on any of the disputed Senkaku islands. Okinawa Prefecture Tuesday morning, the largest-scale intrusion since Japan purchased three of the five islands in the Senkaku chain from their private owner in Sep. 2012. The eight ships surpass the entry of six ships on Sep. 14th of last year. China also claims the uninhabited East China Sea islands, which it calls Diaoyu. In Tokyo, Japanese Vice Foreign Minister Chikao Kawai summoned Chinese Ambassador to Japan Cheng Yonghua to the Foreign Ministry and protested the intrusion. Kawai demanded that the eight ships leave the waters immediately. According to the ministry, Cheng said China cannot accept the protest. At a news conference, Chief Cabinet Secretary Yoshihide Suga expressed displeasure with the intrusion, describing the incident “highly regrettable.” Asked about the view that the incident has to do with the visits by some ministers of Prime Minister Shinzo Abe’s cabinet to the war-related Yasukuni Shrine over the weekend, Suga said, “I don’t think there is a causal relationship” between them. China regards the Shinto shrine in Tokyo as a symbol of Japan’s past militarism. The shrine honors Class-A World War II criminals among the war dead. It was the 41st intrusion into Japanese territorial waters near the Senkaku Islands by a Chinese government ship since the nationalization. The previous case happened Monday. There is information that boats linked to a Japanese political group are headed to the Senkaku Islands. According to the 11th Regional Coast Guard Headquarters in Naha, the eight Chinese ships crossed into Japanese waters near Uotsurijima and Kubajima, two islands of the Senkaku chain, between 7:25 a.m. and 8:25 a.m. The coast guard is warning the Chinese vessels to leave the areas. The Japan Coast Guard says two Chinese fishery patrol vessels are sailing in the contiguous zone just outside the Japanese waters. Japan’s Maritime Self-Defense Force days it plans to continue providing indirect support for the Japan Coast Guard. Adm. Katsutoshi Kawano, the MSDF’s chief of staff, made the commitment after the eight Chinese maritime surveillance ships entered the Japanese territorial waters. The coast guard has been at the forefront of activities near the islands, Kawano told a news conference. “We’ve been providing indirect assistance. There are no changes in our stance,” he said. China’s State Oceanic Administration said Tuesday it sent eight surveillance ships to waters near the islands after a number of Japanese vessels were sighted nearby. China News Services, a wire service for overseas Chinese, quoted media reports from Hong Kong that claimed more than 80 Japanese members related to a right-wing group aboard 10 boats have left Ishigaki for the Senkaku Islands in order to carry out research on fishing. The Chinese said the Japanese were set to arrive at the area late Tuesday. It said that after three of its Haijian ships patrolling the waters around the Senkaku Islands came across a number of Japanese vessels, the administration ordered an additional five patrol ships to head for the waters. Upon arrival, the Chinese fleet divided into four teams and carried out monitoring of Japanese vessels violating China’s sovereignty, it added. Japanese Prime Minister Shinzo Abe expressed his determination to block any Chinese attempt to land on the Japanese-controlled Senkaku Islands. “I’ve ordered authorities to respond decisively to any attempt to enter our territorial waters and land on the islands in Okinawa Prefecture,” Abe said at a meeting of the House of Councillors Budget Committee. “If by any chance” Chinese nationals set foot on the islands, they will naturally be removed forcibly,” Abe said. Abe also noted Beijing is believed to have responded to a flotilla of Japanese fishing boats sailing toward the Senkaku islets by dispatching the eight surveillance ships. Meanwhile, he hailed the recently signed Japan-Taiwan fishery agreement for waters around the islands as a “major step forward for fostering a security environment in Asia. We reached the agreement, based on an announcement by Taiwan in February that it will not cooperate with China over the Senkaku Islands,” Abe stressed. Faced with Okinawa fishermen’s strong protest against the pact, the prime minister said efforts should be multiplied to gain their understanding.